We finally finished the master bedroom! Mr. Buckets of Burlap made this headboard. We had some old tongue-n-groove barn wood, taken from an old shack on my husband’s Aunt’s farm. So, he cut the boards to random heights and screwed them to 2 long 1x6s. We found the chandelier at Lowe’s on clearance. It was a little added surprise. The vintage “cowboy” tub came from a vendor at Canton Trade Days. I filled it with our extra pillows and quilts. and I think I like it better in here. 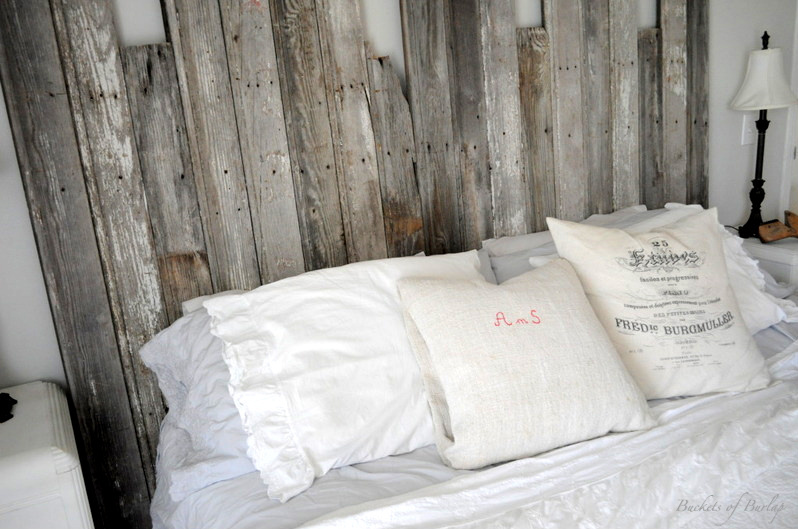 The new headboard adds a rustic element to a romantic room. You may notice a few changes in this corner, from my last post. If you’d like to check out the BEFORE photos, go HERE. Thanks for sticking with me through the makeover! Wow.That is neater than any pictures in any magazine I have ever seen..I love the corner with the door and window..I just put a window like that in my Rose garden and still have my thinking cap on as to what to do next (besides bricks all around it and some mulch in the middle) It has been hard to try and work outside since it rains 6 out of 7 days every week. I am going to show your headboard to Billy and give him a lot of hints..Love it..Love the whole room..how big is yor room? I should have went "HERE" first and I wouldn't have had to ask about the curtains…. You never disappoint Becky. I commented before on the corner when you posted it, loved it all. Love the headboard, the tub and those curtains. The whole room just looks lovely. Well now, you KNOW I'd be all over this one! A pallet bed table to boot! Crazy awesome and what a gorgeous photo shoot. Girl… this is really cool. In love with that bed its Heaven. Lovely transformation, love the mixture of elements that you have used! Becky this is so beautiful!!! 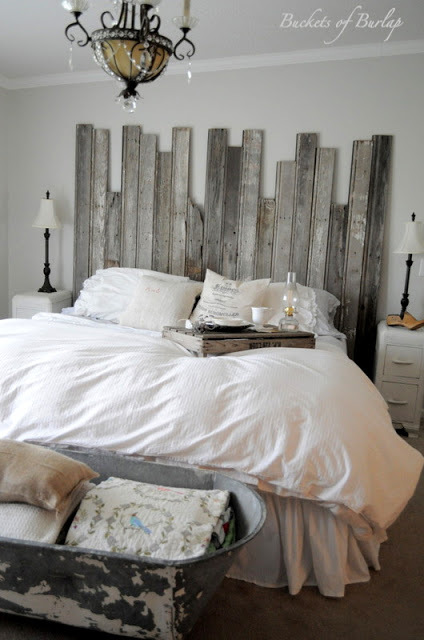 Love that headboard!!!! How unique is that?! 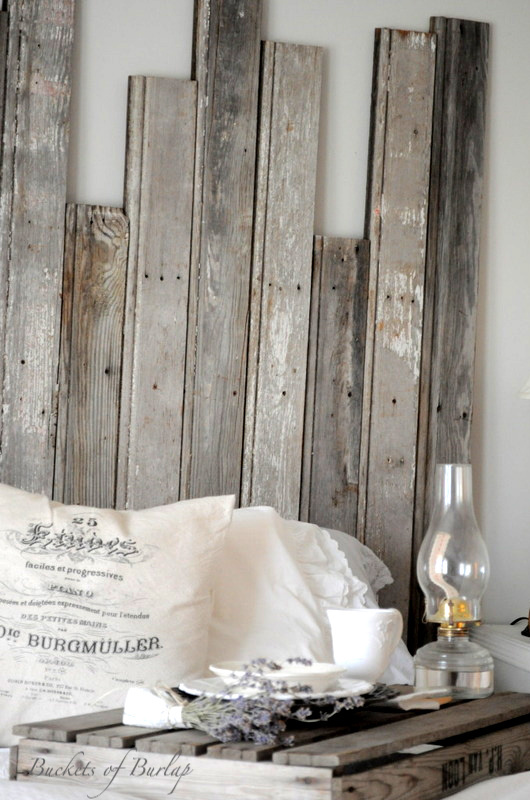 I love barnboard!! 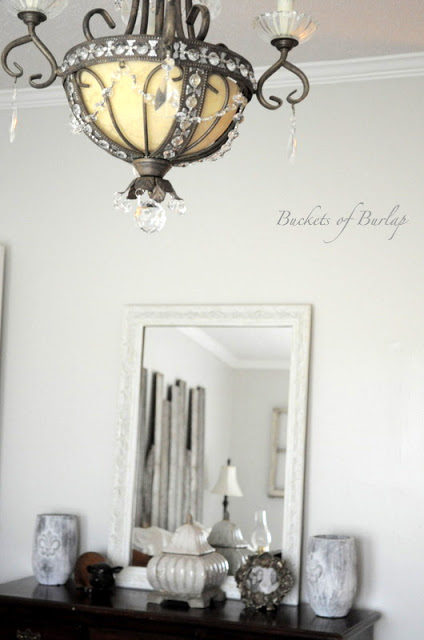 Your chandy is beautiful with everything ; the tub at the foot of the bed is a nice surprise! Everything goes perfecty together..what a gorgeous room!!!! this left me speechless … well done my friend … call in the editors amnd the photographers. I'm stealing a few ideas … giving credit where credit is due. Your master bedroom looks great! Love the headboard and curtains…….looks beautiful!!! How different is the room from before, I went back and looked. Is it the same sized bed. Room looks bigger now. Love that tub. I just love all the textures in your bedroom. I love the crystals from the chandelier to the wonderful worn wood on the headboard. I also like how you have mixed dark furniture pieces with the whites. Looks wonderful – LOVE the chandy! Really gorgeous!! I'm in the middle of re-doing ur bedroom- so much painting- amd I wanted a new light fixture. I love the one you chose- may have to hit Lowes today!! Bravo!! it looks amazing becky. i love the headboard. perfect touch. i wouldn't want to leave. STUNNING!! Ohhhhhh that cowboy tub!!!! wow…stunning! that headboard is soo unique! well done! Becky it is all gorgeous and that headboard is fabulous! How I wish my hubby could whip up something like that. I love the corner with the old door too. Now come to my house and help me with my master, it is horrendous!! Becky you have outdone yourself! All your additions are amazing, it just gorgeous! Hubby did a great job on the headboard (love it) it makes such a great statement and I just love the cowboy tub at the foot of the bed. Such an unexpected yet handy thing to have around! WOW! How awesome. I would LOVE to have your room. 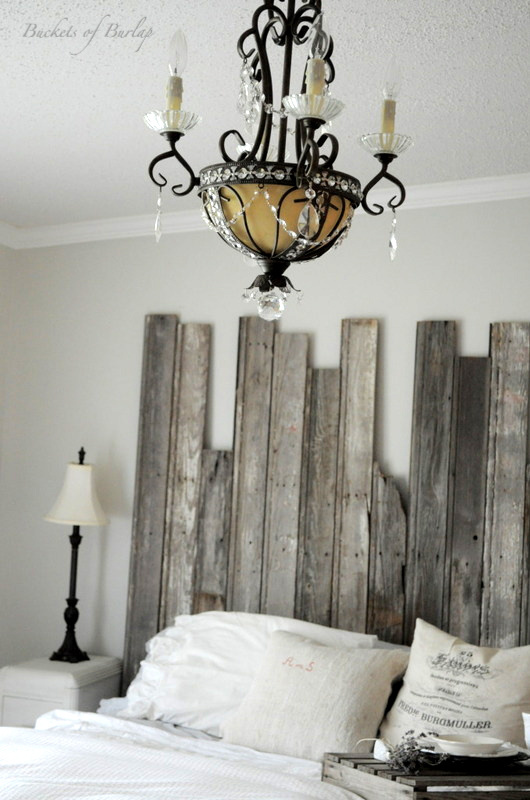 Your Hubby did an awesome job on the headboard…that is such a cool idea! I also like the cowboy tub at the end of the bed and the old door in the corner. LOVE IT ALL. Thanks for sharing…. Beautiful! 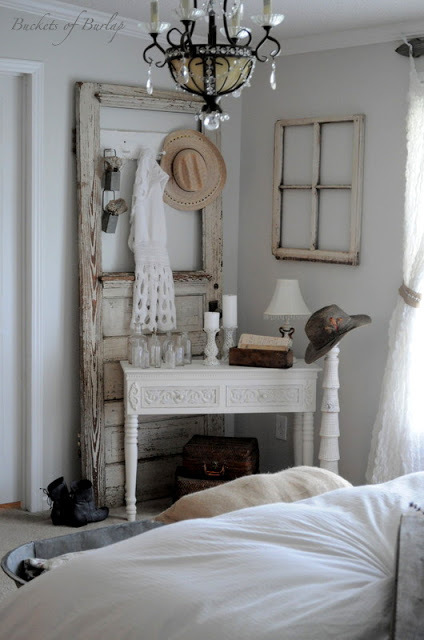 Love the door hanger, the headboard and the LIGHT! Absolutely gorgeous, every single detail. The headboard is awesome!! I'm getting inspired…. Your bedroom is stunning and you have certainly considered every element to perfection. Beautiful job! Neat headboard! Oh wow! I am so in love with your bedroom! Seriously! You and your husband did a fantastic job! Darling Becky, your bedroom is simply stunning, especially the bed with its skirt(and headboard too)and the little to-take-picture-from corner! Wow Becky! your bedroom is dreamy, I love it, that little corner is beautiful, your husband did a great job with the headboard. Beautiful!!! Oh Wow!!! It is so beautiful and dreamy!! Love, love, love it!! I'd say thats worthy of a magazine shoot, what a fabulous look! omgoodness …as of today we BOTH have 999 folowers …. what????? I love that you are Buckets of Burlap and I am Burlap Luxe! "Burlap and luxury"
I love it, I bet no one else has one like it, so original and cool! 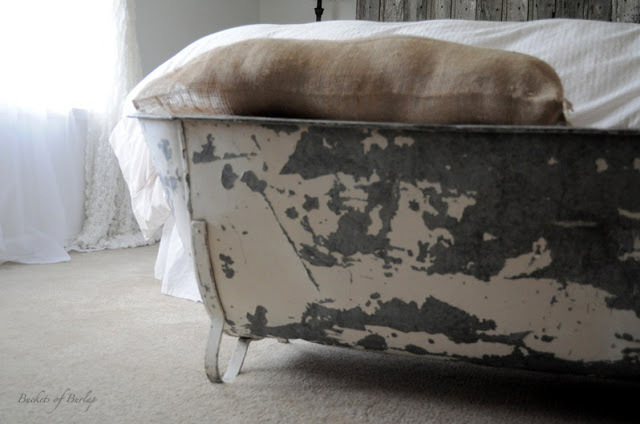 Love the tub filled with quilts, the headboard, the glamour and rust is awesome! I LOVE that corner with the door, looks like it should be in a magazine! I am kinda headed your direction, going to spend the week in Canton, hope to look up LaurieAnn's. OH and the headboard, brilliance! I enjoyed looking thru your blog You have really found your style! Very creatine. Im a new follower. Visit me sometime and say hi. FABULOUS!!! Your makeover should be on HGTV or in a magazine. Well done. Such a pretty transformation. I really like that headboard and your linens! Absolutely stunning! A room full of tranquility, calm and ambiance. Well done my friend! Absolutely GORGEOUS!! I have some great ideas for pieces of my own that I haven't used yet, thanks to your post! Also, now following you, and thanks to your "Where Bloggers Create" button, have joined the party…thanks!! I love the room! The contrast between the white and rough board and texture on the old bathtub …at least that is what it looks like and the door….love it! Just found your blog. Your bedroom is beautiful. Can we all say "Fifi needs to meet Becky"? Your bedroom looks amazing! I love it so much. 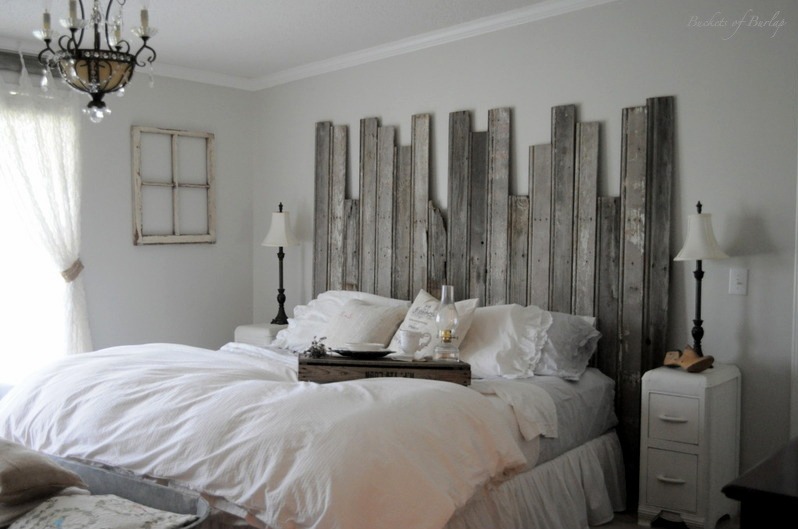 That is such a great idea for a headboard and it came out beautiful. Love! 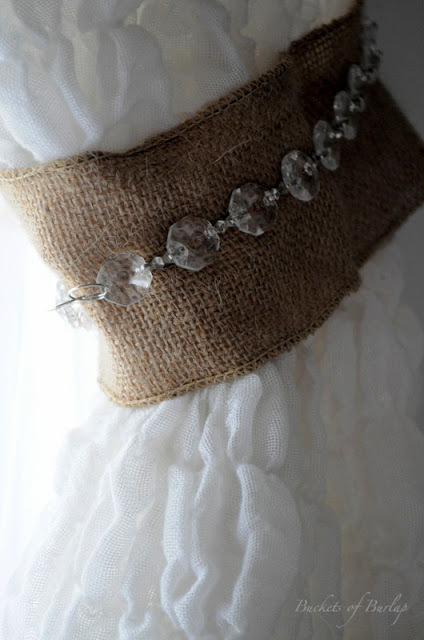 Just came across your blog and I really enjoy it, I'm slightly obsessed with burlap too! 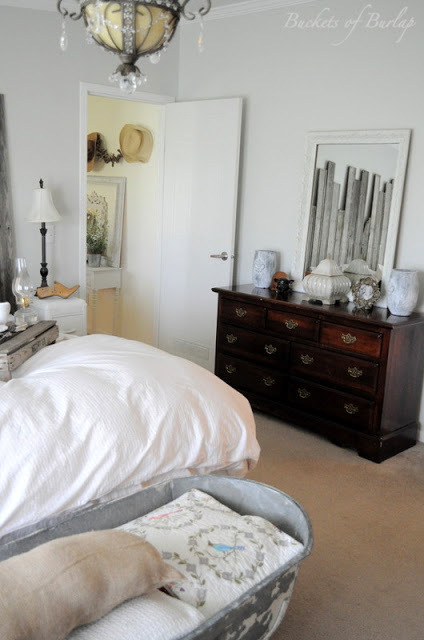 Your master bed room makeover is amazing, truly inspiring. What a unique, beautiful headboard…your Mr. did a great job! The whole room looks stunning, like something featured in Fifi's book! Wow! I love the whole thing! What an amazing job your husband did on the headboard. I love the "cowboy tub" with the pillows and such. The bird one especially caught my eye. 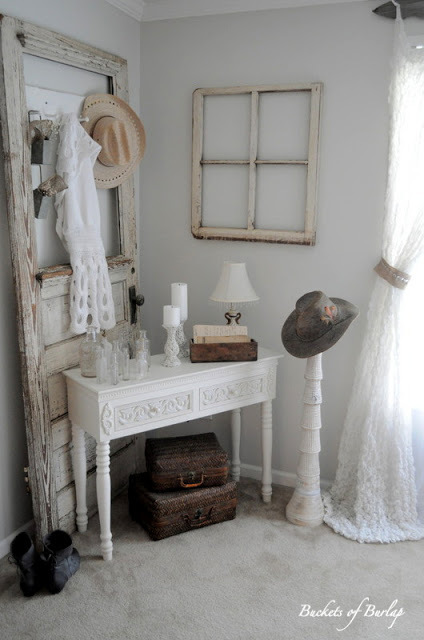 I love the corner with the old door, simply gorgeous. Love it all! i didn't like the yellow glass bowl. while washing it i noticed that the yellow coating was rubbing off so i used steel wool and was able to scrape all of the coating off of the glass. it looks much better now….just in case you wanted to be able to do that. i also painted mine off white and i love it so much better now. 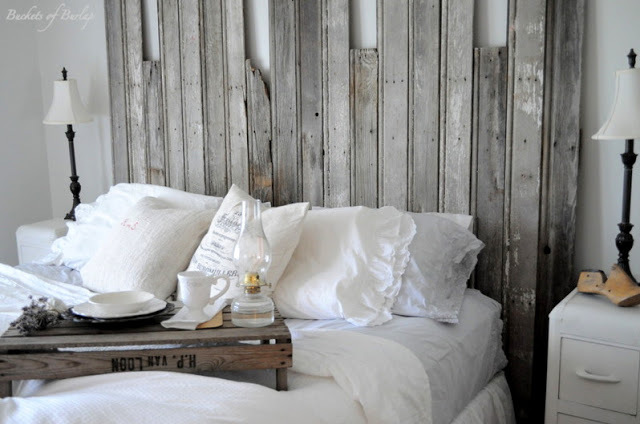 i love that headboard and the room looks so cozy….great job. Beautiful, unique, inviting, romantic. Your room looks wonderful! I love all the architectural pieces. The tub with the over spilling pillows and quilts is also to die for! I'm back. This bedroom just feels strangely familiar… like it's my own. That's how close you rang true to my own style. Just, wow. Lovely headboard! Wonderful photography…loved my visit here! beautiful! Your room is wonderful! Oh Becky, GORGEOUS!!!! It looks absolutely amazing! I love the headboard and love the cowboy tub! I would love to have one of those full of pillows! Love the room and especially the tub! Love, love that headboard! What a great idea. Oh, what can I say about that tub? To DIE for! You did a fantastic job. The chandelier looks like it was designed for the room. Becky it all looks great, the headboard really turned out cool. I really need to redo my room but it will have to wait until winter. I love your bedroom! Do you know what the wall color paint is called? And that headboard, to DIE for!!!!!!!! What a beautiful space!! 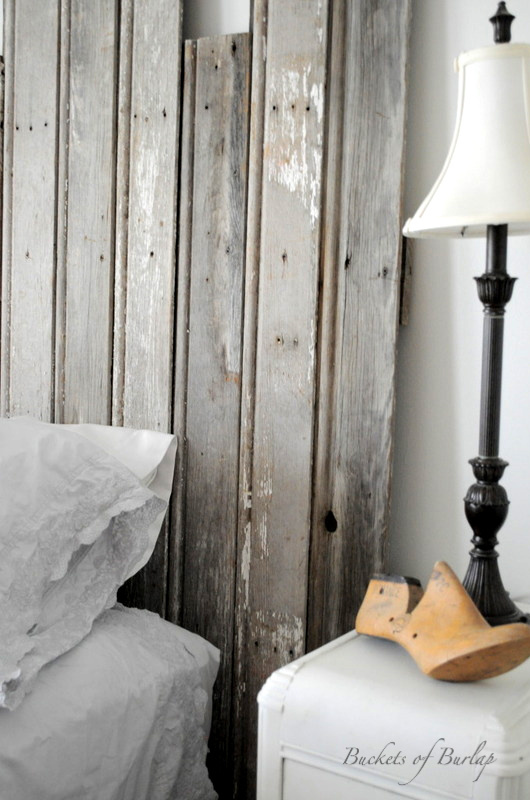 Love the headboard & all the small details that come together to create this gorgeous room! So pretty & so serene!! 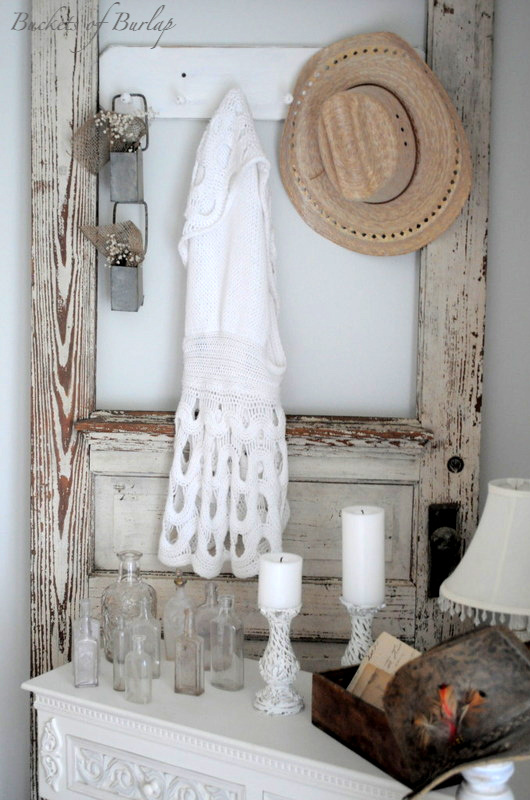 Love the idea for the curtain rod! Beautiful!! I love this and would love to know what your curtains are made out of or if they were premade ones! Beautiful! Just how I like it, a bit rustic and a bit romantic. So many pretty touches too. Gorgeous! the headboard is perfect! I'm planning a similar one, myself! Your bedroom looks Ah-mazing!!! Love it!! Oh please list here in the comments where you purchased your gorgeous bedroom curtains ! I just discovered your blog this morning and love it! It will take me awhile to go back in time but you're quite talented-thanks for sharing your love of all things "decorating'! I love your new bedroom-nice! Can't wait for more ideas for you! Since I have a Cowboy I love your "Cowboy tub"! fabulous! love the mirror shots, the chandelier, and of course that awesome headboard! I really like the texture the headboard brings to the room. It looks like something out of a magazine. Wow, wow, wow, your room is beautiful! I'm going to get my husband to make me something now! I just stumbled on your blog, and I love it! I particularly love your master bedroom! Great job! this bedroom is STUNNING! Love it…..it really inspires me. 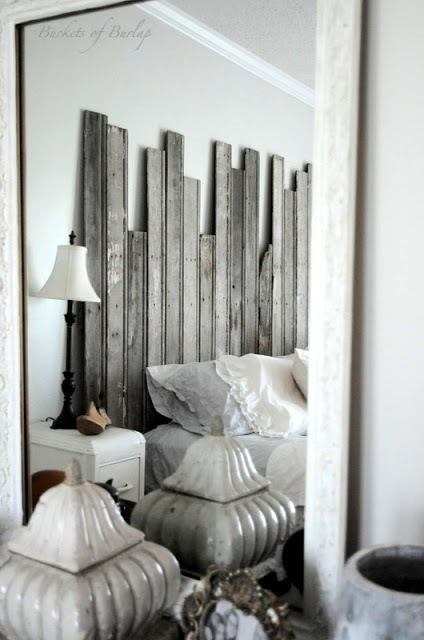 We have been trying to think of some creative ideas for our bedroom and I just might try and find some barnwood and do the same thing!!!!!!! Jen, at littlecottagechic. I have looked all over for inspiration for my decorating style. This one left me speechless with envy. Oh to snuggle up in that inviting bed and soak up the luxury. Thank you for the eye candy…I will be dreaming of it all day. Simply yet so elegant. Wow! Really, WOW! 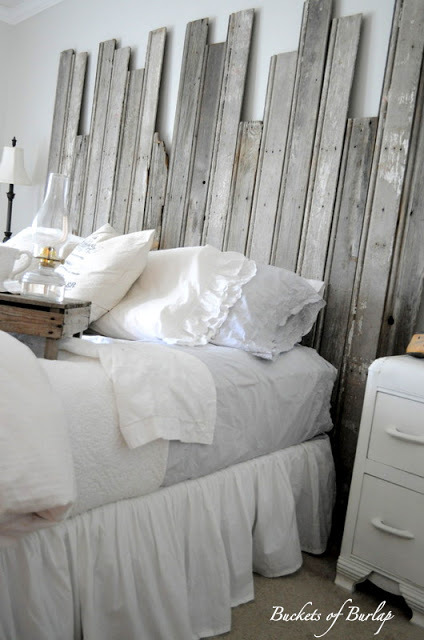 Just gorgeous – I linked this to my master bedrooms post too today, for inspiration! Becky wow how wonderful Your headboard is so so unique!! I also love your armoir it adds a nice contract to the whites and lights in the palette!! Definitely one of the best bedroom make-over that looks great!The chandelier too is great to have in the room. 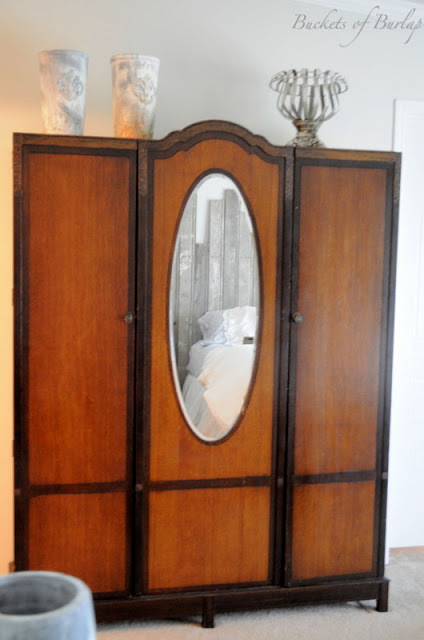 j'adore votre deco de chambre….mis a l'honneur sur mon blog! Could you tell me how your husband made the headboard? Did he sand the wood? How did he finish it? I want to do something similar, but don't want to end up sleeping on splinters!!! Thanks! did you have to do anything to the wood? a stain or anything? such a gorgeous transformation!! Love the wall color! Do you remember the name/number because I'm dying to paint my room this color!! I love the white accent table where did you find it? The whole room is beautiful! Not sure how I missed this snooping around your web site, I know I've seen the tub before, but anyway the headboard is awesome. I could do that, so I'll pin it to remind me. 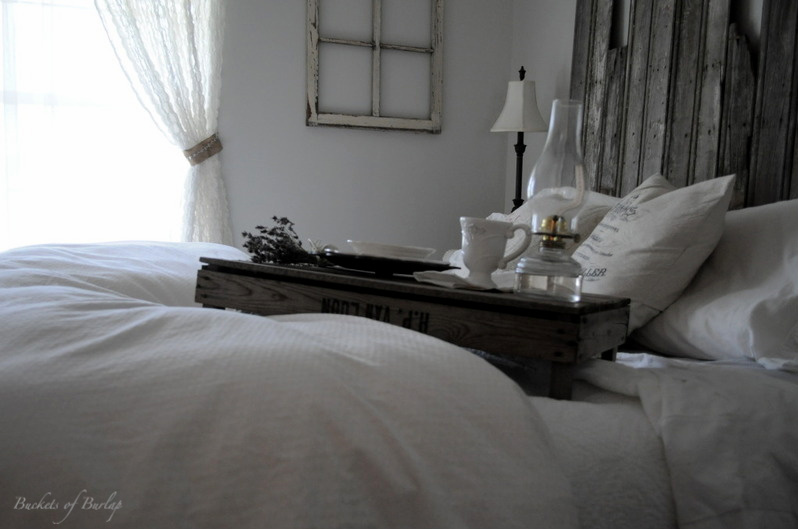 love the tray and the headboard! may try a similar one for our guest room bed! we made one for our room out of pickets years ago and still use it! i love your ideas! I love this room! What color of paint did you use on your walls? Your style is so lovely! Pinned it! WOW. Not sure if there is anything left to say. You are a genius!!! A REAL genius!!! I have to show my hubby and I bet he will say: 'Ugh..that is just junk and it will peel all over, make a mess,blahblahblah….shut up! I am going to try this!' 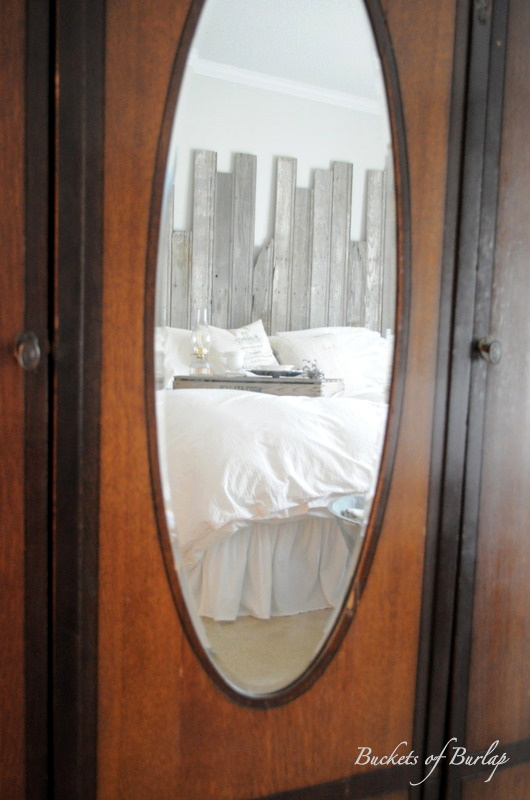 LOL I wanted to do a headboard from old doors as we live in an old 1842 one room school house! Tiny, but…and we are planning to move to TN in 2 yrs and cant wait to do this to the new house! Think I'll start practicing on THIS house! Gorgeous, well done and you should do this for a living!! Like Junk Gypsy's!!! Thank you foг another great artіcle. info in such an ideal meаns οf writing? 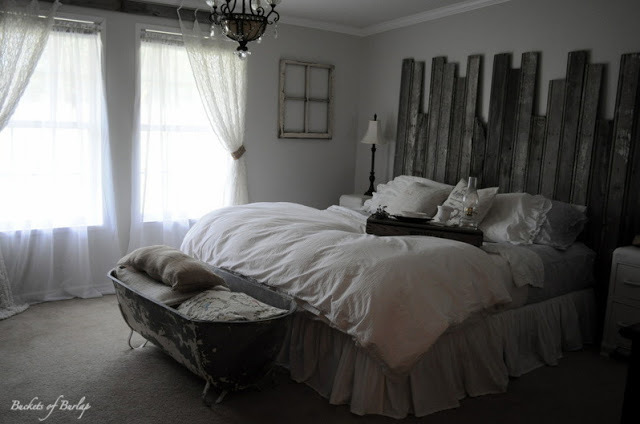 I absolutely love the headboard and bed! Gorgeous! I'm so in love with your farmhouse. It's so wonderful! You do an amazing job decorating. I love your decorating style! 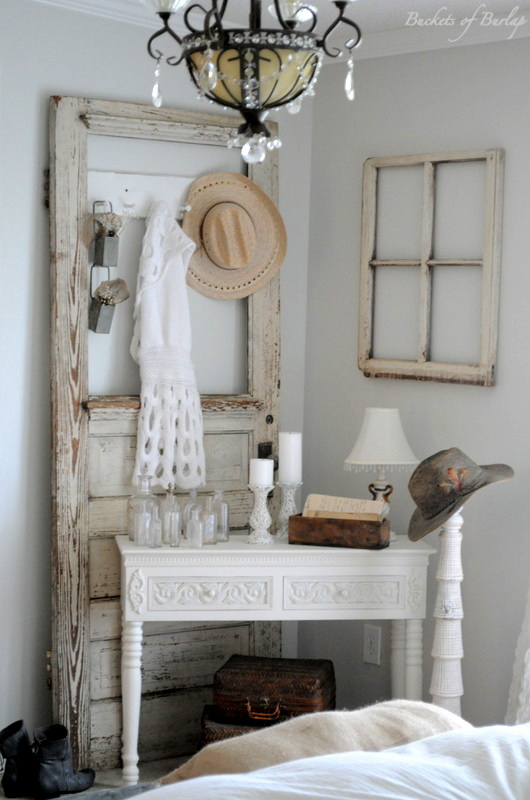 Love the old door! I had just bought one the day before I saw your blog. I was telling a coworker I bought an old door and she looked at me like I was crazy! Then I saw your blog and showed her the pic and she was like, "oh, that is too cool!"